Well, Hill Country, that’s some damn fine brisket. Simple seasoning. Nice and moist. If you’re a barbecue fanatic from North Carolina or other such locations where brisket isn’t considered “real barbecue,” you’ve probably already stopped reading this. And, boy, are you missing out! But for those open-minded characters who want to hear about a new place in D.C. for good eats, lemme tell you a bit more about Hill Country Barbecue Market. It’s not out in the country past the “city limits” sign… Oh, sorry. Forgot I’m writing this piece for city folk and my Brooks & Dunn references are probably falling flat. So anyway, here’s the deal: you enter the roadhouse-style restaurant and start at the hostess’ podium to obtain a menu card that serves as your tab for the meal. (Do NOT lose your card, lest you pay the steep lost card fee.) 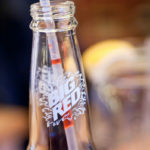 You get seated, a server takes your drink order – many of which are served in Mason jars – and then you visit the market area of the restaurant to get your food. This is where the experience takes an interesting turn. 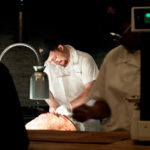 For the meat, you order by the pound (or the piece, if you don’t know a third of a pound from a quarter). Our group shared a variety of cuts of meat and sides, which was a great way to experience several tastes while keeping the caloric and monetary budgets in check. – Manage portions and your budget by ordering less than you think you want to eat. Because of the market-style setup, you can always go back for more. 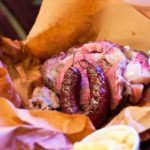 One of the barbecue specials that appealed to me was the Longhorn Brisket Chomp. 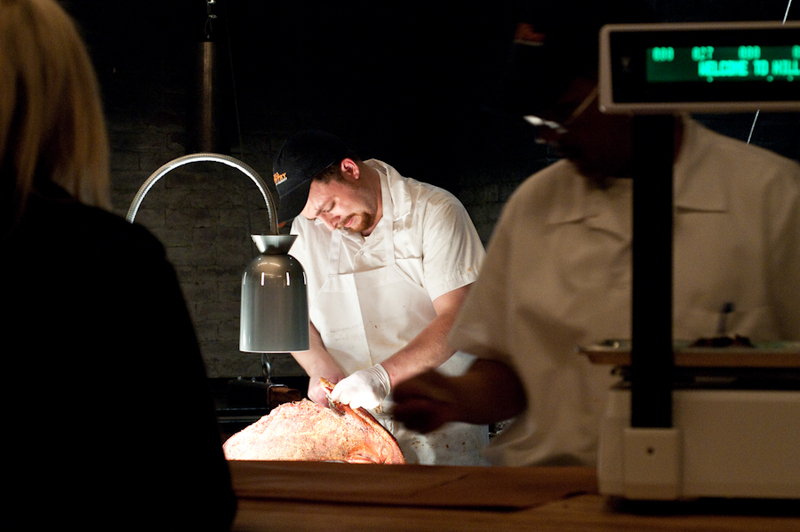 For $11, you get 1/3 pound of brisket (about 3 slices), an 8-ounce side dish and cornbread. That’s a decent serving, and you’ll probably have room for dessert, too! – Enjoy the moist brisket! Three pieces is a good place to start. 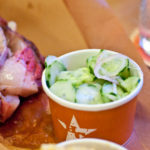 It’s truly excellent and moist, and the chef recommends eating a bite of Cool as a Cucumber Salad – basically sweet, vinegary pickles and onions – with the brisket. It’s a delightful combination. 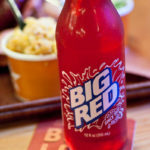 – Get that six-cheese macaroni, the Longhorn Cheddar Mac & Cheese. It’s cheesily sinful and definitely one of my favorite dishes. – Try the creamy White Shoepeg Corn Pudding, too, with hunks of corn and simple seasoning. – Ask your hostess, server, the general manager, the bartender, everyone for Shiner Smokehaus, a seasonal beer from Spoetzl Brewery that I’ve had the pleasure of enjoying only once and while I was in Texas. It’s a tasty, smoky brew that I’d love to see in D.C., if only available for a limited time. After all, if Kreuz Market sausages and Blue Bell Ice Cream can be flown in on a regular basis, can specialty Shiner cervezas be far behind? – Leave room for dessert. Much of the dessert menu is new to Hill Country, making its debut in the D.C. market. Though I really wanted to try the decadent PB&J Cupcake topped with Reese’s Pieces, I opted for a slice of red velvet layer cake. This was a special treat, as the cakes change monthly, and the sweet-tart frosting between layers is less dense than expected. 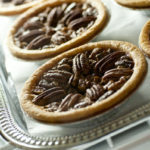 The inner icing is a combination of sour cream and cream cheese. There’s a more dense cream cheese-only frosting on top. 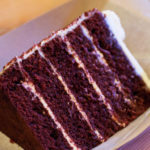 The cake is not for the faint of heart at $10/slice and weighing in at about a pound, so be prepared to share with a couple of friends or take it home for later. 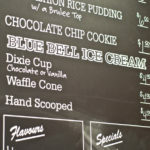 Be sure to treat yourself to Blue Bell Ice Cream, a true Southern delicacy rarely found in the Washington area. – Stay for the music. After dining in the upstairs meat market, check out the downstairs “meet market,” aka Boot Bar that offers live music several nights each week. Remember two-stepping to the Wil Gravatt Band at Whitey’s on Thursday nights in Arlington as you downed a Shiner Bock (or three)? *sigh* You’ll have to move some tables out of the way to make room to two step, and the Shiner is going to cost a bit more, but Wil Gravatt you will have, along with a slew of other “American Roots” musical artists. (Can we get some Hot Club of Cowtown, please, folks?) Most shows are free; check www.HillCountryWDC.com for days and times. 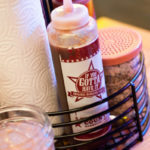 Hill Country Barbecue Market is located at 410 7th Street, NW near the Gallery Place-Chinatown Metro stop. 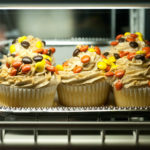 Follow them on Twitter @HillCountryWDC. Hot Club of Cowtown would be great, as would The Quebe Sisters: http://quebesistersband.com/. If this place had been around when I lived in DC, I would have been tempted to stay! So glad you got to experience Hill Country BBQ in DC. I’m so jealous too. I love their NYC location and can’t wait to be back in DC to visit the new outpost.